LiquiGard containment systems are designed to store fuel, chemicals and potable as well as grey water. Based on our proven EconoTank, ModuTank and Compakt tank systems, LiquiGards combine the best features of bladders and steel walled tanks. They can be configured in virtually any modular width and length to accommodate site restrictions or storage requirements, and are available in capacities from hundreds to a million gallons or more. LiquiGards are fitted with one-piece drop-in primary and back-up secondary liners fabricated from a wide choice of reinforced chemically compatible fabrics. They are sealed with floating covers manufactured from the same materials as the liners. Covers float on the liquid’s surface and rise and fall with the liquid’s levels. 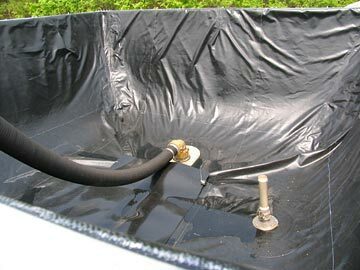 Both primary and secondary liners as well as floating covers are attached to LiquiGards with gasketing and unique clamping method. 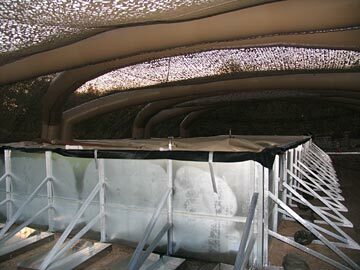 Multi-function LiquiGard steel walls eliminate hydraulic forces on the liner and cover while physically protecting them from accidents and the elements, unlike unprotected and exposed bladders that are vulnerable to stress induced failure as well as physical intrusion. Modular steel components of LiquiGards are engineered for hand-carrying and rapid bolt-together assembly on virtually any level, firm site, indoors or outdoors, by workers using common hand tools. No special skills or heavy equipment is required. Dangerous, catastrophic bladder failures and almost instantaneous loss of product is often the result of minor physical damage, as well as failed seams due to constant liquid pressure, chemical and UV exposure. These problems are minimized by LiquiGard SC secondary containment tanks that are designed to snugly contain standard bladders within protective steel walls that transfer hydraulic pressure from the bladder directly to the LiquiGard. Bladders act only as liners within LiquiGard, not as load-bearing structural members. Pressure is eliminated from the bladder seams and material, thereby extending it’s useful life. LiquiGard’s tightly fitting double liner completely contains leaks within their walls, unlike typical secondary containment berms that allow exposed product to rapidly flow in the gap between the damaged bladder and berm, the LiquiGard SC transforms a total bladder failure into a fully containable leak with minimal to no product loss or contamination. A choice of factory fabricated heavy-duty flexible bladders are available for potable water storage as well as for the containment of waste water, jet fuel, diesel fuel, petroleum products and many industrial chemicals. A membrane liner positioned between the wall and bladder is supplied for secondary containment. A unique non-penetrating leak detection system positioned between the bladder and secondary liner is optional. A wide range of inlet/outlet piping connections and vents is available to suit your liquid water storage needs and preferences.